How do I fit the Sagem ECU chips? Below you will find descriptions of how to find your Sagem ECU depending on what vehicle you have, a link to the video we have posted on YouTube showing how to fit them and also a PDF file of the instructions supplied with our chips. Located in the engine bay, behind the right hand headlight there is a large plastic cover over the battery. Behind the battery you will see the main wiring loom disappear into another black plastic container with a lid held down by two phillips screws. The Sagem ECU is located in here, remove the two phillips screws then remove the three multi plug connectors. Located in the engine bay on the left hand side of the car, technically above the passenger footwell. Located in the engine bay on the drivers side of the car, the ECU is under a plastic white cover which is held in place with one bolt. Although we have supplied many ECU chips for these we have never needed to ask a customer where his ECU is :-) We believe it would be inside the car under the dashboard however please let us know if we are incorrect. Our RPi Wizard Video on chipping your Sagem ECU. 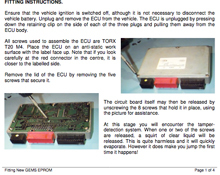 Sagem ECU Chip fitting instructions.